GBP/USD, Pound back after CPI and dovish BOE. The Ponud buyers didn’t manage to break 50.0 fibo return from the September 18./30. fall in the last four days and after today’s CPI soft data and dovish BOE members, decline was inevitable. 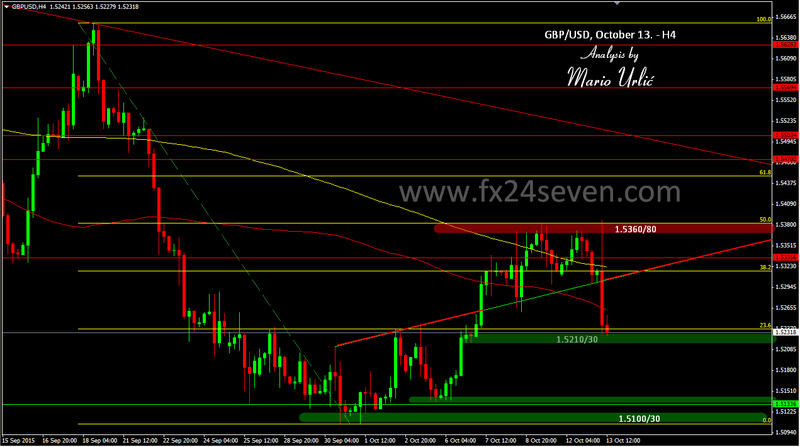 H4/MA’s 100&200 are broken, the strong support at 1.5210/30 is under heavy pressure. If this support breaks, double bottom at 1.5100/30 is possible target for the bears. Interesting morning at the British currency, that’s nice. I was pointed at this levels and trendline in my last GBP/USD analysis.